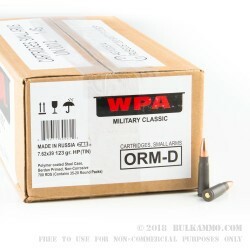 This 7.62x39mm cartridge from WOLF Performance Ammunition’s Military Classic line of ammunition is packed in a durable steel spam can, which if left unopened can protect its contents against corrosion for several decades. 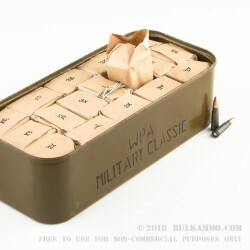 If you want a reliable cache of ammunition for your AK-47 for practically the rest of your life, then these 700 rounds are the perfect investment to make. This cartridge sports a 123 grain hollow point projectile which will expand within soft targets after impact to inflict incredible damage. 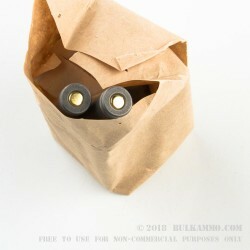 Its non-corrosive Berdan primed steel casing may not be fit for handloading, but the low price it conveys is appealingly reflected in this spam can deal’s price. The cartridge’s steel casing sports a polymer coating, which not only grants it additional protection against corrosion, but facilitates in feeding and ejection as well. Q: Are the bullets magnetic? 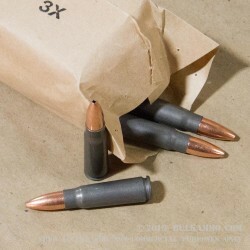 A: These rounds do have a bi-metal bullet and will attract a magnet. Thy are not indoor range safe and will not pass a magnet test. Q: Does this come with the opener? A: Yes, those cans do come with the opener.